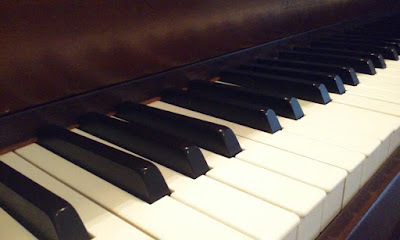 In honor of Valentine's Day, I decided to share the top five reasons that I love teaching piano! 1. Teaching piano allows me to be creative. As I prepare for each week of lessons, I look over my notes from the previous week to see what needs to be improved upon and find creative and engaging ways to meet those needs. I've especially enjoyed putting together games and activities that can be integrated into different aspects my students' lives. One of my favorite things to hear from a student is, "Oh! Mrs./Mr./Ms. X talked about this in (music, history, math) class!" 2. I enjoy listening to my students play the piano. Sometimes I hear the same piece played by 4-5 different people in one day. Instead of feeling bored and thinking, "Oh, great. I have to listen to this piece AGAIN! ", I listen to it as if it is for the first time. Every student playing that piece has their own unique personality; each one comes from vastly different backgrounds and have had life experiences unlike anyone else's and they bring all of that to their lessons and it comes across in the way that they play the music in front of them. 3. Music has a direct and meaningful impact on the lives of my students and their families. I've fortunately never heard anyone say, "I wish that I never took piano lessons! They ruined my life!" Piano lessons enable people to find a creative outlet beyond the daily grind of work, school, and household responsibilities. It's so delightful to see adult students diligently pursuing a lifelong goal, and children growing into capable musicians. 4. Flexible schedule that enables me to spend more time with my children. I am so blessed to be able to have extra time with my children. They are growing up in a home where there is constant music, and they have the opportunity to interact with people of all ages and backgrounds on a regular basis. I truly believe this will benefit them as they grow up and begin to figure out who they are and what their purpose is in this world. 5. I deeply enjoy teaching. Truly an INTJ, I love planning ahead and preparing for lessons, classes, recitals, community service projects, practice incentives, camps, and anything else that is simmering in my imagination! And, because I'm self-employed, I have the freedom to pursue these ideas and see their fulfillment. I can't imagine doing anything else!